Last weekend we traveled to my cousins wedding and our nephew Sam was the ring bearer. It was a beautiful wedding and isn't there just something about watching a beautiful bride walk down the isle to her groom. There is that feeling of new beginnings and the beauty that love itself brings. 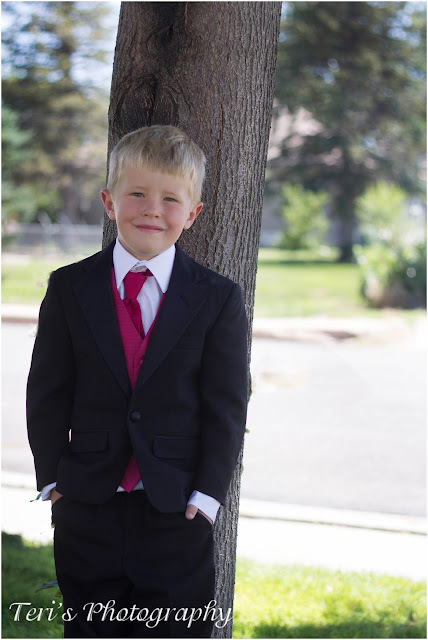 I am sure Sam was not so thrilled with Aunt Teri again but a five year old in a tux...well I couldn't resist. We all had so much fun seeing family and dancing that night away! Wishing this beautiful new couple all the good that life can bring them!